The Otterbein United Methodist Church was formed and remains a neighborhood church with its primary mission and focus on Robinson and the surrounding community. The roots of the church started in the late 1800’s with a Robinson Class of the United Brethren in Christ. The Class met in various places for several years and in 1895 built their first church on the present-day church lot, in the location where the Education Building now stands. In 1903 the original church was outgrown and a new church was built on the spot where the current church building stands. In 1904 church membership was 104 people. The church continued to grow and need more room, and in 1920-21 the current church building was constructed. 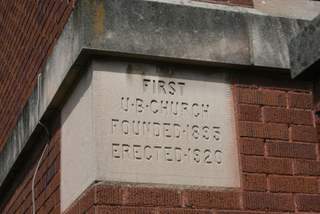 At the time of dedication the church name was The First United Brethren Church. It became Robinson Evangelical United Brethren when the United Brethren and the Allbright Brethren merged to form the Evangelical United Brethren in 1946. After many years of sustained membership and growth, the church again needed more room and in 1964 the Education Building was completed. An interesting fact is that Leonard Schernekau, Sr. , was the general contractor for the 1920 church construction and Leonard Schernekau, Jr. , was the general contractor for the 1964 Education Building construction. In both cases they were members of the church and did much of the work themselves. In 1968 the Evangelical United Brethren and the Methodist Church voted to merge and become the Methodist Church. This necessitated a change for our church and it became Otterbein United Methodist Church. It was named for Phillip Otterbein, one of the founders of the church. Our church’s symbol of clasped hands united in Christ can be traced to Phillip Otterbein. Robinson Otterbein United Methodist Church shared a link.